But what if millions of independents are really just a confused and clueless horde, whose interest in politics veers between the episodic and the non-existent? Indeed, the Democracy Corps poll reveals that our next holders of state power might end up being chosen by a minority that seems to stands for very little—or, perhaps, for nothing at all. Kazin misses two important points about independents. First, like many others, he overestimates the proportion of the population that is truly independent, writing “After all, loyal Democrats and Republicans still compose at least two-thirds of the electorate.” It would be more correct to say that loyal partisans compose about 90% of the electorate. See here. Second, he seems to imply that independents choose political leaders for no good reason or even no reason at all, simply because majorities agree with the claims of both parties. Of course, without delving below simple percentages—50% of independents said “X,” 50% of independents said “Not X”—we can’t really know how many specific independents took contradictory positions. I’ve looked in the poll results and don’t see that information. But more importantly, independents actually vote in predictable ways. Much more than partisans, they vote for the party advantaged by two fundamental factors: the economy and war. I’ve noted a similar point before. Let’s consider the relationship between economic growth and war and the presidential vote for only the 10% or so of the population that is truly independent. 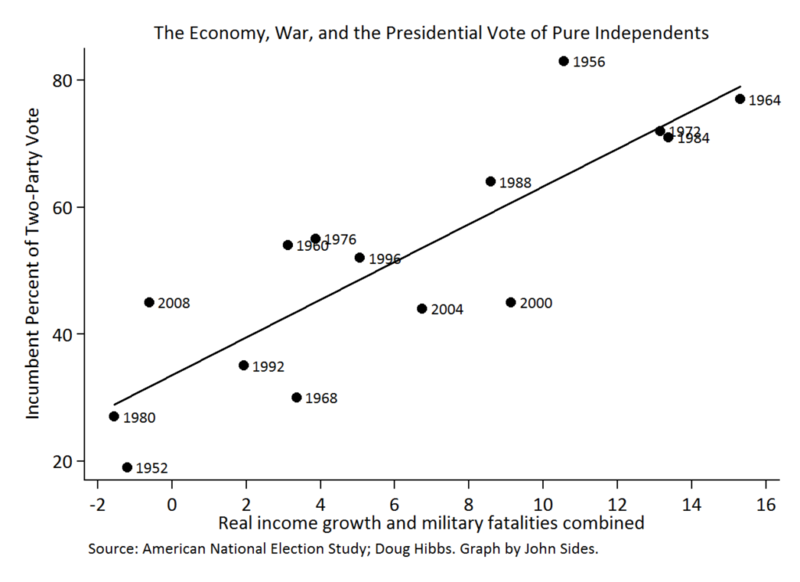 In particular, I rely on a measure from Doug Hibbs that combines income growth and military fatalities in war, and American National Election Studies data on presidential voting by party. Interesting, though, that a regression line through last three elections would be flat. Adding the 1990s wouldn’t change that much, either. Does that suggest that the relationship might have weakened over time? the measure of whether or not true independents are “confused” would rest not on whether *we* can make sense of their votes, but on whether or not *they* can. Great post, I sometimes have trouble when explaining independents to lay people. They either think that independents are idiots with the attention span of a goldfish or indifferent jerks. Reality, and people, is more complex. I suspect this has not a lot to do with the wisdom of pure independents, but rather with the wonders of aggregation. To paraphrase Stimson, noise cancels out and whatever order there is tends to dominate. Also, the figure is based on independents who voted, which could screen out the most confused. In the “measure from Doug Hibbs that combines income growth and military fatalities”, income growth and fatalities contribute in opposite directions. That is, high income growth favors incumbents; high fatalities weighs against incumbents. This is implicit in the discussion, but others may make the same mistake that I did on first examining the graphs, thinking that “and” means “added to” in the label “Real income growth and military fatalities combined”. Arguably, it is much easier to make the case that Democratic and Republican voters are the most irrational people casting ballots in the United States. They are, after all, voting for Democrats and Republicans!!! Kazin’s article is nothing more than an anti-Independent hit piece. Consider his original point: is it really so surprising that a majority of likely voters might agree with Republican and Democratic talking points? When Republicans state that Democrats are dishonest and out of control, and Democrats say that Republicans are reckless and hypocritical, who could disagree? 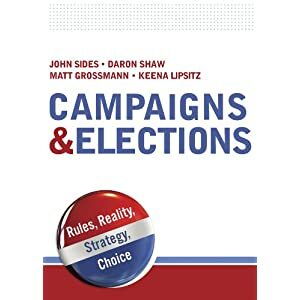 Fortunately, many of us in the “independent horde” need not rely on an impression gleaned from a single survey by a partisan research outlet to draw conclusions regarding the thoughtlessness and myopia of the Democratic and Republican parties. Democrats and Republicans provide us with new evidence to support our considered judgment in that regard on a daily basis. The argument made by Democracy Corps is deeply demeaning and they commit the fallacy of composition. Exactly the attitude and sloppiness I would expect from them. The whole point of classifying people as “Independents” is that these are people who don’t adhere to a “party line,” NOT that they are a third party. Of course, as a group they will be all over the place, they have nothing in common except what they are not (Dems or Repubs); that does NOT mean that the individuals are scatterbrained, they just each have their own opinions. If they all agreed they would be a thrid party.